Home closings: Are your experts well trained? Does the ‘American Dream’ include renting? A recent study of San Francisco home foreclosures found widespread irregularities in almost all the home seizures scrutinized. The report, commissioned by San Francisco Assessor-Recorder Phil Ting, was prepared by Aequitas Compliance Solutions Inc. of Newport Beach. Us: What did your report show? Lou: We reviewed about 16% of all foreclosure sales that occurred in San Francisco from 2009 through 2011. The audit shows that 99% of the sampled foreclosures contain at least one irregularity and 84% appear to contain one or more clear violations of law. Us: What were the key problems identified in your report? Lou: We looked at six general subject areas, including assignments (which relate to chain of title), notices of default and trustee sale and suspicious activity (like robo-signing). The report, which you can download from the Aequitas website, explains these things in laymen terms. Within each subject area, we looked at a variety of issues. Two-thirds of the loans had four or more exceptions and more three-quarters of the loans had violations across three or more of the six subject areas. In other words, this was not a case of most of the loans having one irregularity. Most of the loans had many irregularities across different stages of the foreclosure process. We also compared the MERS database to public records. MERS was created by the mortgage industry as, essentially, an alternative to the public land records system. It is an electronic registry for tracking ownership interests and servicing of mortgage loans. We found that in 58% of the cases the beneficial owner of loan as entered on the trustee’s deed upon sale conflicted with the owner of the loan according to the MERS database. Us: Weren’t most of these homeowners likely to lose their homes to foreclosure anyway? Why does this matter? Lou: That’s a very good point. Many of these homeowners simply overextended themselves and the resulting foreclosure sales were inevitable. So, what’s there to really care about? What’s at issue here is compliance with California’s laws relating to non-judicial foreclosure. These are statutory requirements that, in many respects, are rather technical. Why, then, should inadvertent violations provide windfall remedies to reckless borrowers? First, its important to understand foreclosure in California. Lenders in California rely almost exclusively on the non-judicial foreclosure process, also called statutory foreclosure. This is an expedited process where homes are sold without court approval. Therefore, there is frequently little, if any oversight. Because of this, courts have generally required strict compliance with statutory requirements affording borrower’s due process. Now, there is plenty of public evidence showing that not all distressed borrowers are reckless deadbeats. We know that some borrowers did not receive fair and accurate disclosures, as required by federal law, explaining the payment and other material terms of their mortgage. Furthermore, the report reveals that a lot of lender’s foreclosing on homeowners don’t appear to own the underlying loans. The fact that homeowners borrowed something, on some terms, from someone should not be enough to rob them of their due process right. To say most of these borrowers are deadbeats and can be denied their due process rights seems pretty lousy to me. It’s like saying that there might be a falsely accused guy on death row, but—hey—he probably killed someone. But look, the purpose of this report is not to indict the mortgage industry or bailout borrowers. What’s at stake here is more than merely fairness and homeowner’s due process. Foreclosures impact not only homeowners but also entire communities, housing markets and mortgage-backed securities holders like pension plans. The integrity of California’s record title system is also at stake because the validity of title for subsequent purchasers is dependent on those that precede it. So addressing this problem is critical to the recovery of the housing market and national economy, and that’s something that everyone has an interest in no matter their political leanings. Us: Are these problems confined to San Francisco, or do you think the same problems are occurred throughout California? Lou: The study focused exclusively on San Francisco. However, we are now working with other counties in California requesting similar studies. My understanding is that lender and servicers practices are essentially the same in San Francisco as elsewhere in the state. And, of course, the same laws apply. So, we’d except to see similar irregularities in other counties, including those hit harder by foreclosures. 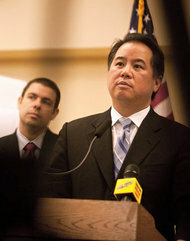 Us: How widespread do you think the foreclosure irregularities are in Orange County? Lou: I cannot speculate as to whether the problems are the same or different. The foreclosing parties are generally the same cast of players and the laws the same, so you’d expect a strong correlation. 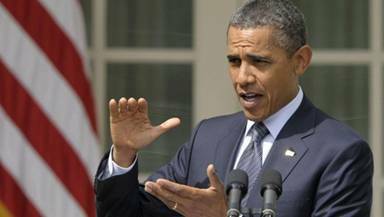 Us: What led to such a high rate of irregularities and illegalities in foreclosures? Lou: It goes back to the origination boom, which was fueled by low interest rates and lubricated by an insatiable securitization market. Lenders’ operational infrastructure couldn’t keep pace with record fundings, and so you had lots of missing and incomplete documentation. These loans were sold and resold and ultimately packaged into securities. Along the way, the necessary paperwork documenting these loan sales fell through the cracks and, once the market turned, a lot of the sellers of these loans disappeared. Servicing is a business of razor-thin margins, and these folks had a tough time dealing with record volumes of new and exotic products that didn’t play nice with their systems. When the party got broken up, the servicers were left to clean up a big mess. Ultimately, all this stuff above made it infeasible to carry out large-scale foreclosures. That’s why you hear all this stuff about forged or back-dated documents and robo-signing. There are gaps in title that need to be filled. This is also why this is such a big mess to fix. You might have bought a loan but you never got a receipt and now the seller is dead and buried. Its difficult to imagine how the industry can cost-effectively solve these problems ex post facto. Us: What’s the key lesson? Are the foreclosure laws antiquated? Lou: Yeah, that’s it. If there is one lesson to take away from this report it is that, with so many homes being foreclosed and with so little oversight, California’s foreclosure process appears utterly broken. Remember, these laws are more than 100 years old. The non-judicial foreclosure process was created long before things such as the secondary market and mortgage brokers existed. Back then, you rode your horse to meet with the banker, who you knew on a first name basis… sort of like It’s a Wonderful Life. Surely the mortgage industry has much work to do in order to correct the weaknesses and deficiencies in its foreclosure practices. But to prevent this from happening again, change needs to come from the legislature. The mortgage industry has since seen remarkable innovation over the past few decades. Considering the extent and consequence of the issues, perhaps it is time for the legislature to be similarly innovative. Us: How do you think the laws should be changed to catch up with the complex world of mortgage securitization? Lou: As is often the case, it’s much easier to identify the problem than the solution. I have a lot of thought on this but, quite frankly, they require much explaining and go into some pretty arcane and mundane stuff. Basically, ensuring clear chains of title and the integrity of California’s record title system are essential to the recovery and stabilization of the state’s housing market. So we need laws and systems in place that achieve these objectives without increasing overall costs to mortgage lenders and society generally. Smart people will disagree on the best approach. But we should all agree that the status quo is unacceptable. Learn more about Aequitas HERE! … a record has been created that someone not of record title purported to take action on a Deed of Trust prior to compliance with Civil Code 2932.5. The court will not sanction conduct by this Defendant which puts into question the validity of the nonjudicial foreclosure process and California real property records. Though this issue could have been simply addressed by the recording of a new notice of default months ago, the ninety days under the new notice of default allowed to run and this creditor be on the door step of conducting a nonjudicial foreclosure sale consistent with the California statutes, it has elected to continue with the existing notice of default, subsequent substitution of trustee, and sale. The contract between the parties is the Note and Deed of Trust. Though not artfully done, Macklin sufficiently explains that he asserts superior title to the Property over the Trustee’s Deed through which DBNTC asserts its interest in the Property. Given that Macklin has asserted that DBNTC cannot show that it complied with the minimal requirements for properly conducting a nonjudicial foreclosure sale, the motion to dismiss the Tenth Cause of Action is denied. February 18th, 2012 | Author: Matthew D. Weidner, Esq. Banks are demonstrating that if you have enough money and influence, you’re not expected to follow the same laws as everyone else. Robo-signing and it’s sibling, “surrogate signing,” is the systematic, intentional misrepresentation or fabrication of evidence in every court of every county in every state of the United States. It is the filing of forged documents critical to a bank’s case in nearly every foreclosure in our country. It’s bad enough that the banks are perpetrating fraud, but what’s worse is that their lawyers are knowing accomplices to the fraud. Lawyers are commonly referred to as “Officers of the Court.” That’s because lawyers take an oath upon admission to the profession to uphold the law and the integrity of the judicial process. We are the gatekeepers of justice. When we lie to judges, the integrity of our judicial system suffers irreparable harm. In Florida, only the owner of the mortgage note and mortgage can file a foreclosure against a homeowner. Usually, the plaintiff in a foreclosure case is someone other than the originator of the loan because the original note holder usually sells the loan. The document evidencing that transfer of ownership is known as the Assignment of Mortgage, which is recorded in the official records of the county where the home is located. The Assignment of Mortgage is a critical piece of evidence in a foreclosure because it establishes the plaintiff’s “standing” to foreclose. 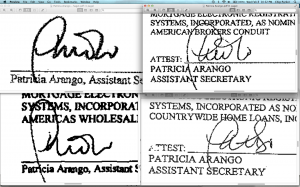 Here is a screenshot of four signatures of one “Assistant Secretary” of Mortgage Electronic Registration Systems as “nominee” for various mortgage originators. Clearly, all four signatures do not look alike, even though this is allegedly the signature of the same person. But this person isn’t just a person – she’s a lawyer. And she’s not just any lawyer. She’s the litigation managing attorney at The Law Offices of Marshall C. Watson, P.A., one of the largest foreclosure law firms in the State of Florida, and I spoke with her just two days ago! The fraud being perpetrated goes like this: The plaintiff needs the Assignment of Mortgage from the originator of the loan to the plaintiff to create “standing.” So, the plaintiff’s own lawyer creates the assignment, allegedly transferring an interest in land, and signs it herself. The lawyer then actually records this fabricated document in the county official records and also files it in the actual foreclosure case. But what about a chief judge who is in cahoots with this foreclosure firm? Well, one of Marshall Watson’s newer lawyers is the former Chief Judge of Broward County, Victor Tobin, who, just before joining the firm, designed Broward’s notorious “Rocket Docket” foreclosure court that radically tilts the judicial process in Marshall Watson’s favor. Someone really should tell Florida Attorney General Pam Bondi about this lawyer. Oh wait. She already knows. Florida’s Attorney General has had an ongoing investigation of Marshall Watson for years. The investigation was started by Bondi’s predecessor, Bill McCollum, but the moment she took office, she was more focused on shutting down such investigations, starting with her firing of the bulldog attorneys assigned to foreclosure fraud. In Marshall Watson’s case, they settled for $2M, but nobody was prosecuted for any crimes. Well, even if Attorney General Pam Bondi ignores fraud on the court, surely The Florida Bar is investigating this lawyer because The Florida Bar HAS TO take robo-signing by lawyers seriously. But the Florida Bar doesn’t investigate robo-signers. To the contrary, The Florida Bar HIRES THEM to oversee attorney ethics investigations (The Florida Bar has in the past and will probably again investigate ME for speaking the truth). I AM NOT MAKING THIS UP! Well, at least Floridians have our elected state representatives to protect homeowner rights in the wake of this massive fraud. Don’t look now, but a new Florida House of Representatives Bill HB213 is an “expedited foreclosure” bill that actually MAKES FRAUD EASIER for the banks by accelerating the foreclosure process. This bill has already made it out of committee with a 12 – 4 passing vote. Stay tuned for more on this selling out by our elected legislators. It’s getting harder to tell, but the signs aren’t good.